Joanna is a Senior Lecturer teaching on undergraduate, master and executive MBA level in London and Dubai. She is teaching courses such as Human Resource Management (HRM), International Human Resource Management (IHRM), Cultural Intelligence (an elective in comparative OB and cross-cultural management) and Business Research Practice in London - an innovative practical course focusing on qualitative and quantitative research methods. As course director on BSc Business Studies as well as MSc Management she has been performing duties of course level coordination, planning and oversight. In this important roles on both ranked programs she has positively influenced the enhancement of programmes curriculum, organisation as well as the quality of the student experience. 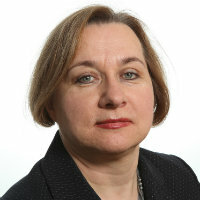 She is responsible for introduction of consultancy international field trips to emerging market economies on MBA and master programs involving Russia (St. Petersburg), Argentina (Buenos Aires), Brazil (Sao Paulo), Vietnam (Ho Chi Minh City) and to Poland (Krakow, Gdansk and Warsaw) in Cass Business School. These stimulating trips sit alongside students class teaching experience and offer an invaluable opportunity for practical tests of their learning and to broaden their understanding of global business culture. She has received her PhD in International Management from University of Kent at Canterbury as a fellow of European Commission Programme (Market Access Europe). Since 1998 she was a research fellow at The Leading Edge Research Consortium in London Business School which focused on the alignment of business strategies with HRM. Her research interest centres on organisational justice of HR procedures, International HRM and cross-cultural management as well on skills of doing business in emerging market economies. Zaleska, K.J. (1999). Integrating case: Organisational and national cultures in a Polish/U.S. joint venture. In Cullen, J.B. and Parboteeah, K.P. (Eds. ), Multinational Management: A Strategic Approach (pp. 101–107). South Western - Cengage Learning. ISBN 0-538-89034-7. Zaleska, K.J. (1996). Cross-cultural interaction in management between Polish and American managers. In Muller, B. (Ed. ), A la recherche des certitudes perdues: anthropologie du travail et des affaires dans une Europe en mutation, Les Travaux du Centre Marc Bloch Berlin: Les Travaux du Centre Marc Bloch. Siengthai, S., Zaleska, K.J. and Saranya, K.A.I.O.T.T. (2008). Closing the Performance Evaluation Gap in SMEs in Thailand: What Matters? GBATA (Global Business & Technology Association): EVOLUTION AND REVOLUTION IN THE GLOBAL KNOWLEDGE Madrid, 8-12 July. Zaleska, J. (2007). The Cass Consultancy and MBA Programme. ETQ Seminar: Professional skills for a global world: Creating a successful business environment Warsaw, 10-12 July, Visit of The Lord Mayor of London. Zaleska, J. (2005). Change in the context of power and cultural differential: A case study of Polish managers. Academy of Management Honolulu, August 6-10, USA. Nicolescu, L., Mockaitis, A., Vaiginiene, E., Kovaleva, T., Dvorakova, Z., Jeffery, C. … Zaleska, J. (2005). Educating managers using projects between Western and Eastern European countries. 31st EIBA Annual Conference: Landscapes and mindscapes in a globalized world December 10-13, Oslo, Norway, BI Norwegian School of Management. de Menezes, L. and Zaleska, J. (2004). Between new and old career: A study of development and organisational commitment. EIBA European International Business Academy Ljubljana, Slovenia, 5-7 December. Zaleska, J. (2004). Business development field trips in an emerging market economy: New methods of cross-cultural training. International Assciation of Cross-cultural Comptence and Management Universita Parthenope, Naples, Italy. Gratton, L., DeMenezes, L. and Zaleska, J. (2004). The rethoric and reality of the 'new careers'. Academy of Management New Orleans. Zaleska, J. (2002). Managing Performance: The impact of different sources of justice and choice on employee attitudes? Academy of Management Denver, USA. Gratton, L., De Menezes, L. and Zaleska, J. (2002). Sources of mobility: An empirical test of the boundaryless career. 18th European Group of Organisation Studies (EGOS) Barcelona. Zaleska, J. (2002). The impact of different sources of justice on employee attitudes. British University Industrial Relations Association (BUIRA) HRM Study Group Workshop Kingston University, London. Gratton, L., De Menezes, L. and Zaleska, J. (2002). The rethoric and reality of the new careers. Harvard Business School Conference London, 13-15 June. Gratton, L. and Zaleska, J. (2002). Unfairness and injustice in HR practices: Who is to blame? Academy of Management Denver, USA. Gratton, L. and Zaleska, J. (2000). Careerism: A function of age or an adaptive response to the organisation's career development. Academy of Management Toronto, Canada. Zaleska, K.J. (1999). Juniors and Seniors: Longitudinal Case Study of the Socialisation Process of Polish Managers into a Multinational Corporation. HRH Conference: Confronting Theory & Reality 19 November, Rotterdam School of Economics, Netherlands. Zaleska, J. (1999). Junior and seniors: Longitudinal case study of the socialisation process of Polish managers into a multinational corporation. HRH Conference; Confronting Theory & Reality Rotterdam School of Economics, 19 November, Netherlands. Gratton, L. and Zaleska, J. (1999). Organisational justice research in Leading Edge Research Forum. EDEN Doctoral Seminar on Organisational Behaviour and Human Resource Management University of Lausanne, April 26, Lausanne, Switzerland. Zaleska, J. (1996). Cross cultural interaction between Polish and expatriates managers: The anthropological perspective. European International Business Academy (EIBA), 22nd Annual Conference, December 15-17 Stockholm, Sweden. Zaleska, J. (1996). Doctoral tutorial. European Doctoral Programmes Association for Management and Business Administration (EDAMBA) Leuven, Belgium. Zaleska, J. (1996). Impact of cross-cultural interaction with expatriate managers on management style of Polish managers. Second AIDEA Giovani International Conference, June 6-8 Bocconi University, Milano, Italy..
Zaleska, J. (1996). Role of expatriates in subsidiaries of multinational corporations. Workshop. Third Biennial International Conference on Advances in Management Framingham, Massachusetts, June 26-29, USA. Zaleska, J. (1995). Cross-cultural interaction between Polish and American managers. Lecture Series "Social Anthropology in a changing Europe Center Franco-Allemand de Recherches en Sciences Sociales, January 18, Berlin, Germany. University, B., England, and Zaleska, J. (1994). Doctoral proposal. Doctoral Workshop in Advanced Research Methods for International Business & Management UK chapter of the Academy of International Business - ESRC, September 5-8. Siengthai, S., Zaleska, K.J. and Kantabutra, S. (2009). Closing the Performance Evaluation Gap in SMEs in Thailand: What matters? Academy of Taiwan Business Management Review, 5(1). Zaleska, K.J. and De Menezes, L.M. (2007). Human resources development practices and their association with employee attitudes: Between traditional and new careers. Human Relations, 60(7), pp. 987–1017. doi:10.1177/0018726707081155 . Truss, C., Gratton, L., Hope-Hailey, V., Stiles, P. and Zaleska, J. (2002). Paying the piper: choice and constraint in changing HR functional roles. Human Resource Management Journal, 12(2), pp. 39–63. doi:10.1111/j.1748-8583.2002.tb00063.x . Zaleska, K.J. (1992). Cultural imperialism and cultural response to multinationals. Nationalism Notes pp. 23–27. Zaleska, K.J. and Rowley, C. (2006). Cultural Differences in Citizenship: The Impact of Organisational Justice in Performance Appraisal and Pay in Comparative Perspective. London: London Business School, Centre for Organisational Research. Zaleska, K.J., Gratton, L. and de Menezes, L. (2002). Sources of development and mobility: An empirical test of the boundaryless career concept. London Business School. Zaleska, K. and Gratton, L. (2001). Unfairness and injustice in HR practices: Who is to blame? London Business School. Zaleska, K.J. and Gratton, L. (2000). Careerism: A function of age of an adaptive response to the organisations career development systems? London: London Business School. Zaleska, K. and Gratton, L. (2000). Development and fairness of career opportunities and its impact on commitment and trust. London Business School. Zaleska, K.J. (2000). Trust in organisational authorities and formulation of identity: A case study of Polish managers in a multinational corporation. London Business School. Zaleska, K.J., Gratton, L. and Bleackley, M. (1999). Fair process as the hidden dimension of good HRM practice. London Business School. Zaleska, K.J. (1999). MNCs as agent of change in Eastern Europe. The cases of adjusting to another dependency. London Business School. Zaleska, K.J. (1999). Juniors and Seniors: Longitudinal Case Study of the Socialisation Process of Polish Managers into a Multinational Corporation. London Business School. Zaleska, K.J. and Rowley, C. (2006). Knowledge sharing and organisational justice: Comparative study of Poland, Russia, Thailand and Malaysia. Zaleska, K.J. (2003). Managing performance: The impact of different sources of justice and choice on employee attitudes. Human Relations, Referee, 2005 – present. Human Resource Management Journal, Referee, 2005 – present. Long Range Planning, Referee, 2005 – present. Asia Pacific Business Review, Referee, 2004 – present. GBATA (Global Business & Technology Association): EVOLUTION AND REVOLUTION IN THE GLOBAL KNOWLEDGE. (Conference) Madrid, 8-12 July (2008). Invited speaker. Paper: Closing the Performance Evaluation Gap in SMEs in Thailand: What Matters? ETQ Seminar: Professional skills for a global world: Creating a successful business environment. (Seminar) Warsaw, 10-12 July, Visit of The Lord Mayor of London (2007). Academy of Management. Honolulu, August 6-10, USA (2005). 31st EIBA Annual Conference: Landscapes and mindscapes in a globalized world. (Conference) December 10-13, Oslo, Norway, BI Norwegian School of Management (2005). International Assciation of Cross-cultural Comptence and Management. Universita Parthenope, Naples, Italy (2004). Paper: Business development field trips in an emerging market economy: New methods of cross-cultural training. EIBA European International Business Academy. Ljubljana, Slovenia, 5-7 December (2004). Academy of Management. New Orleans (2004). Co-authors: Gratton & L., DeMenezes, L.
Harvard Business School Conference. (Conference) London, 13-15 June (2002). British University Industrial Relations Association (BUIRA) HRM Study Group Workshop. (Workshop) Kingston University, London (2002). Academy of Management. Denver, USA (2002). Paper: Managing Performance: The impact of different sources of justice and choice on employee attitudes? Paper: Unfairness and injustice in HR practices: Who is to blame? 18th European Group of Organisation Studies (EGOS). Barcelona (2002). Academy of Management. Toronto, Canada (2000). HRH Conference; Confronting Theory & Reality. (Conference) Rotterdam School of Economics, Netherlands (1999). EDEN Doctoral Seminar on Organisational Behaviour and Human Resource Management. (Seminar) University of Lausanne, Lausanne, Switzerland (1999). European International Business Academy (EIBA), 22nd Annual Conference, December 15-17. (Conference) Stockholm, Sweden (1996). Second AIDEA Giovani International Conference, June 6-8. (Conference) Bocconi University, Milano, Italy. (1996). Third Biennial International Conference on Advances in Management. (Conference) Framingham, Massachusetts, June 26-29, USA (1996). European Doctoral Programmes Association for Management and Business Administration (EDAMBA). Leuven, Belgium (1996). Lecture Series "Social Anthropology in a changing Europe. Center Franco-Allemand de Recherches en Sciences Sociales, Berlin, Germany (1995). Doctoral Workshop in Advanced Research Methods for International Business & Management. (Workshop) Bath University, England (1994). A degree that travels well. (2006) City AM (newspaper).